Sweet cakes and biscuits are all very well, for a while, but then you start to wonder how much sugar you're packing in to your daily diet. My moment came while I was on the elimination diet last month. I had to go cold turkey on sugar. Completely. I felt hungover, had headaches and was incredibly lethargic for a couple of days. And then I realised - in the midst of a huge Mars Bar and Coca-Cola craving - that it was a withdrawal symptom from all the sugar I was used to eating. Whether you're following a special diet, want to cut the sugar you're eating or just want to try out some new ingredients, check out these alternatives to regular sugar. Agave syrup comes in the form of a thin syrup (thinner and runnier than honey) that has a low GI index so it won't give you those dreaded sugar rushes. It comes from the spiky agave plant, and is sweeter than honey so you'll need to use less. Use in baking (experiment, but start by replacing the sugar in a recipe with about half the quantity of agave syrup - just weigh it) and also in drinks. A squeeze of agave is great added to a hot camomile tea or you can also drizzle it over pancakes. Agave has a pleasant, slightly toffee-like flavour. The American Diabetes Association says that it's safe to eat if you're diabetic, but you should still count it towards your sugar intake for the day. You can buy stevia now in many large supermarkets, and online. 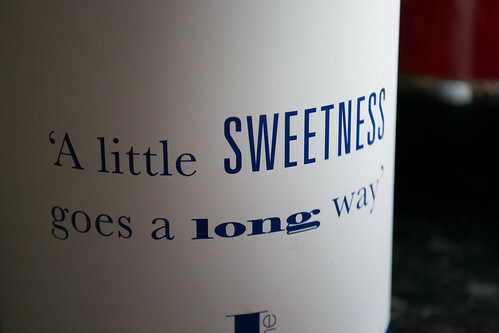 It's a bit of a wonder sweetener. 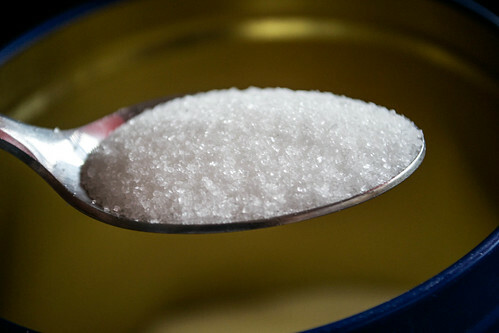 According to manufacturers, it doesn't harm teeth, won't give you blood sugar rushes and is suitable for diabetics. They also say it contains no calories and also has a low GI. It can be used in place of sugar in baking and cooking but it's not recommended for making meringues or caramelising, as it doesn't behave exactly like sugar does when heated. Stevia is 100% plant-based and is 10-15 times sweeter than sugar. Check pack instructions for specific conversion details and check out more details here. We've been eating honey for at least 8,000 years. We know this because a Spanish cave painting from this time shows a drawing of a person with their arm in a beehive, surrounded by flying bees, and presumably scraping out the honey (rather them than me). Honey's been armed with a wide range of health benefits: it's believed to be a natural anti-inflammatory, antiseptic and also an aphrodisiac. It does have a strong flavour, which goes into whatever you're cooking. Honey actually contains more calories than sugar, but it's sweeter so you'll probably use less of it, and obviously, it's natural and unrefined. There are lots of recipes online that use honey instead of sugar in biscuits, cakes and tray bakes. Ingredients that pair brilliantly with honey include: lemon, oats, banana, almonds and, of course, roasted gammon. Similar to honey but darker, with a slightly smoky, toffee-like flavour. Maple syrup pairs brilliantly with raspberries and blueberries and also grilled bacon. It's expensive though, so it's not used an awful lot (in large quantities) as an ingredient in baking but a few spoonfuls will add a nutty sweetness to anything you're cooking. Maple syrup is also great drizzled over baked muffins for a sticky glaze before you top with some chopped pecan nuts. Quick note: the quality of maple syrup varies (buy the best you can afford) and 'maple-flavour syrup' is not pure maple syrup and may not behave in the same way when you're baking with it. The name sounds like it was conjured up by a load of food scientists in a lab, but xylitol is actually 100% natural. It comes from birch wood and has a GI index of 7 (low). It won't give you tooth decay, it's suitable for diabetics (manufacturers say) and contains 40% fewer calories than sugar. You don't have to mess about with conversion tables or worry about how much to use either, because you can use it exactly as you would use sugar in your recipes. The only problem with it is that, eaten in large amounts, it can give you diarrhoea and should be kept away from dogs as it's apparently toxic to them. Note: Diabetes should always be managed by a doctor (I am not one) so to be safe, before using any sugar substitute if you're diabetic, always check with your GP first, or contact Diabetes.co.uk for advice.